Do you ever wish you could meet a literary character in real life, rather than from simply reading about the character through the eyes of a narrator? Although a face-to-face meeting Sherlock Holmes, Jane Eyre, Robinson Crusoe, or even Hermione Granger might be fun, to get the clearest picture of each character you’d be better off speaking to someone who knows them. The same is true when it comes to evaluating job applicants. In fact, during interviews, applicants are known to describe the employee they want to be, rather than the employee a work reference would describe. Reaching out to independent ‘informants’ can help you learn about how the applicant interacts with peers, acts under pressure, and her sense of curiosity and eagerness to learn. This is often the most telling part of the screening process: reference checking. Although it has long been a common practice for employers to ask for references from an applicant, it is surprisingly often the case that the employer simply doesn’t follow through with checking the provided references. The reason for this may be the assumption that an applicant wouldn’t provide a reference that would speak poorly of them, or that the time spent trying to reach a reference could be better spent elsewhere. Wrong on both counts! Many employers feel that a reference is unlikely to provide information that will be useful or change their minds about a potential applicant. However, a 2012 survey of nearly 6,500 people, including 2,494 hiring managers, found that 62% of respondents indicated that a reference they’d contacted did not give positive feedback about a candidate, and 69% of employers said they had changed their minds about an applicant after speaking with a reference. Employers are also sometimes reluctant to provide references, because of the overpowering fear of the ominous defamation suit. A recent Harvard Business Review article titled When Someone Asks You For a Reference suggests that providing a reference for a worthy employee can be a smart career move for you by helping you build strong professional relationships. Stick to the Facts. When giving references, remember to focus on actual, verifiable information. Did you know that truth is an affirmative defense to a legal claim alleging defamation? In other words, for something to be defamatory, it must be false. Instead of providing subjective information about an employee’s degree of effort or bad attitude, answer the reference-seeker with factual examples of the former employee’s performance, ratings, or the results of performance reviews. Be Detail-Oriented. When giving a reference, provide examples in response to questions, when possible. When getting a reference, ask questions that require a more open-ended response, like an example (e.g., “Tell me about a time when…”). The goal of getting references is to gather factual, helpful, independent information about the competency of the applicant, so remember to insist on details. Assess the Totality of the Information. Remember that reference checks are only one tool in your screening toolkit. Although references can provide more insight into the cultural ‘fit’ and day-to-day interactions you might have with an applicant, reference information should be assessed along with all other available information you possess. If someone describes a reference as “…a good salesperson,” is that a positive or negative trait? Is the candidate persuasive or someone who will stretch the truth, or even lie to make a sale? If the information provided by the reference could be interpreted different ways, request clarification. Qualify the Reference. Another way to ensure that your reference checking process is fruitful is to carefully qualify, or select references before making the call. First, what is the reference’s relationship to the applicant? Based on the relationship, is the reference likely to have knowledge of the candidate’s character, job performance, and job skills? Of the long list of prior employers or supervisors from the applicant’s work history, which are likely to know the candidate well? Also, once you start making calls, let the reference know whether the applicant has provided permission for the reference check. Of course, make sure your job application includes a clear statement granting your nonprofit permission to verify any and all information on the application! When developing or revamping your employee screening process, keep in mind that you aren’t limited to an application and traditional interview. Reference checking is potentially the most valuable step in the process. 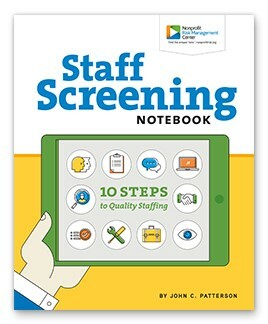 Read the Staff Screening Notebook to learn about the Center’s 10-step approach to screening. 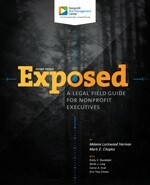 Emily Stumhofer is a former Staff Attorney at Nonprofit Risk Management Center. We welcome your questions about reference checking and other employment screening practices at 703.777.3504.